Back in 2010 Nick (above-left) founded Medical Supermarket with his business partner Udhi Silva. Udhi then bet Nick to see if they could set up another business for just £500. 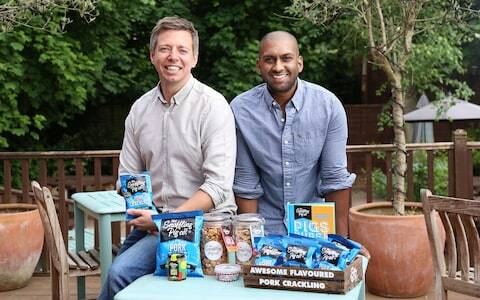 They eventually started The Snaffling Pig in 2014 with just the £500, selling premium pork scratching snacks in a variety of different flavours. They're now turning over £8 million, have appeared on ITV This Morning with an advent calendar and secured investment from Moonpig's founder Nick Jenkins on the BBC Dragons' Den. In 2017 they went on to win Virgin StartUp's Foodpreneur, awarded to the most innovative & exciting new food or drink product in the UK.